There are hundreds of different varieties of cheese that can be differentiated both by the type of milk - raw, skimmed or pasteurized, and by the animal - cow, goat, sheep, buffalo, etc. Cheese is often classified into categories that reflect its appearance, color, texture and/or processing. 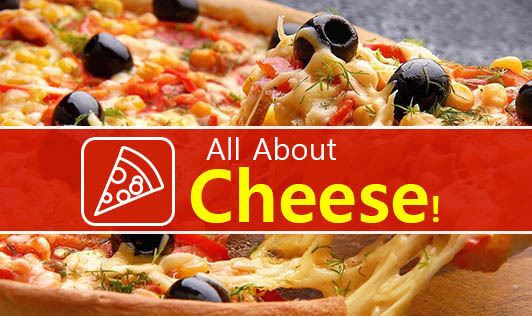 Some of the categories of cheeses are - Fresh, soft, semi-firm, firm cheese and blue-veined. Nutritionally, cheese is obtained from concentrated milk. It potentially shares most of the nutritional properties of milk. Cheese, as we all know supplies a great deal of major nutrients like calcium, protein, phosphorus and fat. They also said to contain good amount of sodium, vitamin A and vitamin B complex nutrients. Cheese is packed with proteins that are essential for children's growth and development. It also helps build and repair tissues in the body. The Calcium present in cheese makes it a vital nutrient for good, strong, and healthy teeth and bones in children and adults. It is especially helpful to maintain bones as dense as possible to prevent the development of osteoporosis in later life. It is a source of vitamin B12, which is vital for red blood cell formation. Being rich in other B complex vitamins, they are good for moisturizing skin and keeping it supple, glowing, and healthy. Some studies claim that cheddar, mozzarella, Swiss and American cheeses can help to prevent tooth decay and protect tooth enamel as they contain calcium and phosphorous in abundance. Cheese contains a compound tryptophan, an amino acid that has been found to relieve stress and induce sleep. Since they are power packed with the above nutrients, it helps in gaining muscle mass and weight in underweight population. As a word of caution! - Those who are lactose intolerant, hypertensive and obese should consult a health expert before knowing your qty of consumption and/or go with low fat versions to relish them in your dishes occasionally. Not only is cheese a nutritious food, it is one of the most prized and enjoyed foods in the world. It can be used as a starter, a main course or as a dessert in Continental and Indian cooking. However, make sure that you include only the right quantity to your diet and exercise regularly, lest you may start gaining kilos! !